'Bold' was the word that kept springing to mind as I viewed the 2015 National Aboriginal and Torres Strait Islander Art Awards (the NATSIAAs) in Darwin and considered the winners selected by a triumvirate of judges. Could there be a recovered confidence in the Indigenous art world after recent lows in both price and artists' enthusiasm – a not unrelated conjunction? For here were Dolly Snell, Hector Burton, Betty Pumani, Barbara Moore, Brian Robinson, Rusty Peters, Bobby West, Glen Mackie and a whole fleet of Yolngu artists from the Buku Larrnggay Art Centre thinking big and complex and expanding their horizons. 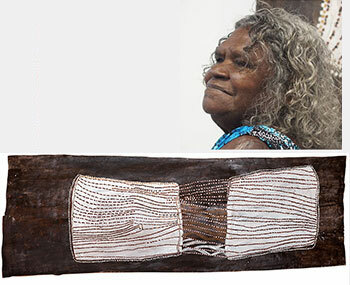 And only two of those names could actually be winners – Jukuja Dolly Snell taking out the $50,000 'Big Telstra' for a work that encapsulates her oeuvre of many years which seeks to bring her desert country around the Kurtal waterhole on the Canning Stock Route up into the Kimberley and her Mangkaja Art Centre; and Betty Kuntiwa Pumani from Mimili whose clear red,white and grey canvases are so recognisable, winning the General Painting Award for a work that's bigger and bolder than usual. Tiny, 82-year old Dolly Snell – one of two winners confined to wheelchairs – even brought her desert into MAGNT, the Museum & Art Gallery of the NT. In front of a canvas about twice her size – the last big work she'll undertake, she announced – she broke instinctively into song to share the snake/man Kurtal's journeys with us, beating time defiantly with dainty but strong hands on the new orange designer leather bag she'd bought for the occasion. The other wheelchair-bound winner was 3D artist Rhonda Sharpe from the very different world of the Alice Springs town camps. She's been here before with her stuffed 'creatures', sewn and decorated on old 'Mish' blankets. But, bravely, she's now progressed to portraying herself – as a two-headed Hydra; both red-eyed, drunken Rhonda and her clear-eyed sober self. It's brave stuff, which she shyly resisted bragging about. But Tangentyere Artists co-ordinator, Sophie Wallace lets her know how proud they are of her. The wheelchair, by the way, was necessitated by an unsteady fall while dancing on a cruelly slippery floor at home! Telstra Youth Award winner, Josh Muir from Ballarat could identify. Just 23 now, his teens went awry with drink and drugs, and an art based on graffiti gave him new direction. “Art is a way of decorating space”, he announces boldly in front of a digital print on aluminium which is as complex in its story-telling as any desert canvas or Arnhem bark. Details poured from his eager tongue involving the Gold Rush, the introduction of Western clothing, graziers' flocks stealing the Myrniong yam from his ancestors, the Post Office versus the scar tree, and the corrupting payment of Aborigines in alcohol and tobacco. Robert Fielding's Works on Paper win was the surprise package. For this articulate South Australian was listed as a Pitjanjatjara man representing the Mimili community. But his history goes back to his Stolen Generation suffering in racist Port Augusta and a conscious removal to the APY Lands to recover his language and culture. “I had to restore who I was as a person; I had no identity in Port Augusta – but I can do my dance now”, he declared in front of a pair of screenprints that involved photography, painting and text announcing “You See Black” and “I See Red” - the substance beneath the human surface that bleeds identically, whatever our skin colour. Hard to know whether to categorise Fielding as an urban or a remote artist. But I think new MAGNT Director, Marcus Schutenko thought him urban when drawing the interesting conclusion about the 32nd NATSIAAs that a higher proportion than usual of works selected from 290 entries were remote (61 out of 65) while a higher proportion of winners (arguably 50%) had urban associations. Whether this is a matter of entrants – I believe many more radical urban Aboriginal artists these days eschew the NATSIAAs – or of decision-taking by judges Tony Elwood, Director of the NGV, Cara Pinchbeck from the AGNSW and Daniel Walbidi, last year's General Painting winner and a Martu man from Bidyadanga – we'll probably never know. But I'd like to think that more practising remote artists be considered as judges in the future – as they were when the Aboriginal Art Awards started 32 years ago. But that leaves what I consider the best to last. 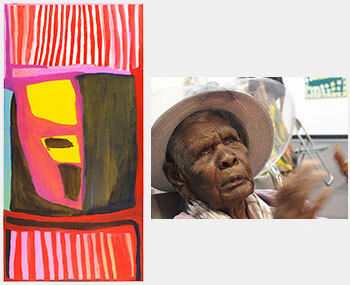 Those fertile Yolngu artists just keep on keeping on! Quite rightly, Nonggirrnga Marawili won the Telstra Bark Painting Award for her outsize work, 'Lightning in the Rock', a reconsidered version of the bark she entered in 2014 that was very nearly rejected as “below par”! It was outstandingly different, and one does have to wonder whether Art Facilitator of the Year (according to the Australia Council), Will Stubbs from Buku Larrnggay was throwing down a challenge to MAGNT with her similar entry this year? Well, the Gallery grabbed it and ran, belatedly recognising the freshness of her imagery and strength of vision, though perhaps they were just overwhelmed by the nine finalists from the same art centre – four having the same surname – Munungurr! Will Stubbs modestly puts this East Arnhemland profligacy down to the influence of Gunibi Ganambirr (not an entrant this year) who re-wrote the definition of 'land' a few years back to include anything abandoned on the land. For ancient Yolngu rote had declared that sacred stories could only be committed to permanent reproduction on the products of Yolngu Country such as bark. So the Wanambis, Wukun and Garawan have availed themselves of perfectly formed boards (Wukun's covered in foil to add extra shimmer to his fish in the water work), thus overcoming the imprecision of bark, Barayuwa Munungurr has added hanging bones to his watery bark, while Rerrkirrwangarr offers a trilogy of delicate barks encapsulating outstation life and myth. Guykuda has produced a bolt from the blue after many an animal sculpture with the production of a 'Yolngu Angel”, wings and all; and Marrayula has conceived a grid of 168 tiny barks – conjuring memories of the Yirrkala Drawings Project – which tell of fish-traps, capturing catfish and failing to net the scared shark. I think my favourite from Buku, though, might be Mulkun Wirrpanda's almost abstract woodblock print,'Rakay #4' which evokes the texture of bark but is unfettered by the old rules that say he has to cover his canvas from rim to rim. It's 'interesting' times for MAGNT. A relatively new constitution outside the NT Government, no Minister to announce the results to the press, leaving the brand new Director, Schutenko to make his slightly nervous mark on his own. 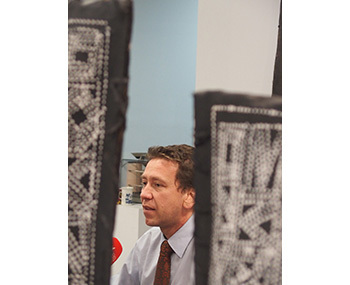 Less nervous away from the cameras, he admitted that a brand new Chan Building in Darwin's city centre for the art part of his museum and art gallery's dualistic role was an exciting prospect, but also a dilemma in choosing whether either (or both) of the NATSIAAs and MAGNT's iconic collection of early Papunya boards should go there or stay at Bullocky Point. This is less than 8 kms from the City, but off many a visitor's beaten track. But it's where the magnificent sunset ceremony by the sea has been held for 32 years to acknowledge Indigenous art achievement. Can that possibly be cast aside?